Our prayer services are uplifting, participatory and full of song. We weave together a tapestry of traditional nusach (the musical modes in which liturgy is chanted), contemporary chants and settings by composers such as Cantor Linda Hirschhorn and Rabbis Hanna Tiferet and Shefa Gold, as well as hasidic and neo-hasidic melodies. We pray in unison, in harmony, through rounds, call and response, chanting and through traditional style davenen— when everyone prayers quietly, but audibly, at their own pace simultaneously. Our congregants are often moved to rise and dance while we’re singing and praying together. Our services are frequently enhanced by outstanding percussive accompaniment and sometimes by guitar as well. Available now! The long-awaited CD with the joyous songs of Jewish Renewal sung by the Musical Prayer Leaders of Kehilla Community Synagogue. Order a CD for yourself right now – and get one for your friends, for your family, for everyone you’ve ever wanted to turn on to this music! If you really want to show your appreciation for Shulamit Wise Fairman, Debbie Fier, Beth Dickinson, Julie Nesnansky, Talia Cooper, Rina Gordon, Edie Murphy and Lisa Zeiler, buy a dozen CDs! Sandra Razieli and Shulamit Wise Fairman are happy to let you know that their CD is now available. The CD is easily accessible for people who’d like a gentle yoga practice that’s accompanied by soothing music. It will be especially of interest to people who’d like to deepen their connection to Jewish prayer through embodied practice. You can order here, or buy the CD directly from Shulamit. Copies are available in the Kehilla office for $15. 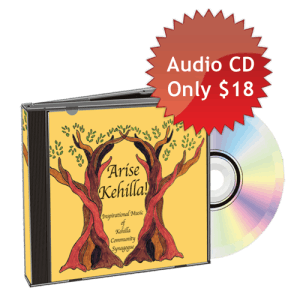 For recordings of basic melody lines for educational purposes by Kehilla’s musical prayer leadership, click on this link: www.kehillabbm.com. More sample melody recordings can be found on the Kehilla soundcloud. Find out more about Kehilla’s Musical Prayer Leaders here. As our community grows and evolves, so does our music. While honoring the melodies that are known and loved amongst us, we also mindfully incorporate new melodies and liturgy into our services to broaden our internal and our shared prayer experience as a community. Our repertoire of sacred music and prayersong is largely, but not exclusively, Ashkenazic. We also incorporate a number of Sephardic and Mizrachi melodies into our prayer. When a particular body of music and liturgy is being introduced, we hold “Songshops,” where everyone gathers in the spirit of learning about the prayers and has a chance to practice learning new melodies together. Over the past several years, we’ve held songshops in preparation for High Holy Days, and for learning the music and liturgy of Kabbalat Shabbat to enhance our fabulous Friday night services. Children attending Kehilla School receive monthly music and prayer classes taught by Shulamit Wise Fairman, our Music Director, and our Musical Prayer Leaders, as well as a weekly opportunity to sing and pray together, led by our School Director, Rabbi Dev Noily, along with various Kehilla School teachers and teen leaders. Shulamit offers adult education courses several times a year that focus on teaching multiple liturgical and musical versions of many of our daily prayers and Shabbat prayers. These courses provide a wonderful opportunity to deepen your understanding of our prayers, to indulge your love for singing, and to experience the many ways that music can enhance your experience of prayer and awaken your senses. Everyone is welcome! We have special music events throughout the year, including performances and workshops by local and international Jewish music acts. We have now twice hosted an “instant choir” event that gives Kehilla congregants who seek to sing and perform Jewish choral music an opportunity to be led by acclaimed composers and conductors, Cantor Linda Hirschhorn and Fran Avni. We also have a congregant-led Chanting Group, Kol HaLev (“Voice of the Heart”) that meets monthly.